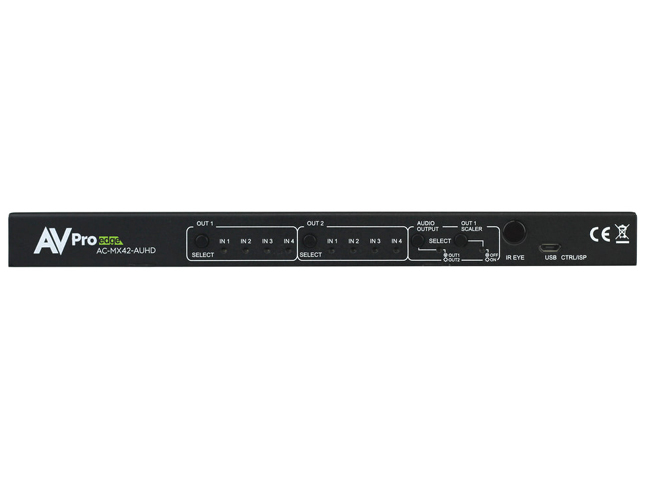 AVPro Edge AC-MX42-AUHD 4x2 HDMI 18 GBPS Matrix Switch with Scaler is a true 4x2 HDMI matrix switch. 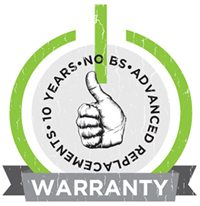 Supporting HDMI 2.0(a/b), HDCP 2.2, up to 4K video resolution, and up to 18 Gbps bandwidth. This switch allows any source (Blu-ray, UHD Blu-ray, satellite receiver, game consoles, PCs, etc) to be shown on any of the connected displays. This matrix equalizes and amplifies the output to ensure the HDMI signal can be transmitted through long HDMI cables without loss of quality. The AC-MX42-AUHD is ideal for bypassing AVR's that do not support full 18Gbps. You can bypass uncompressed HDMI to the display while running down-scaled video into a legacy AVR. Only video is reduced and audio remains untouched, making it an ideal component for systems where high bit rate audio is critical. Conference room all-star. The auto-switching feature makes this unit an ideal, affordable, component for any conference room system. Ideal for feeding a video signal into a video conferencing codec with very little setup. This is an ideal solution for digital entertainment centers, HDTV retail, show sites, data centers, schools, conference and training centers and more! Ideal for overcoming AVR problems - In today's fast moving, high-bandwidth, video market there is often a need to send high bit-rate, bit stream audio into AVR's to take advantage of audio advances like Dolby Atmos or DTS-X. The problem is the AVR's, while especially well suited for audio, lack the robust ability to manage high-bandwidth HDR video. This simple little switch will allow you bypass full, un-scaled, uncompressed video on to displays or projectors and simultaneously down-scale one output to lower bandwidth video while maintaining the original untouched audio codecs, making it ideal for sending this second HDMI signal into an AVR. Auto-Switching (Conferencing) - Ideally suited for conference rooms or environments where you want the matrix to simply switch to the active input, or activate when a device is plugged in. BYOD applications are growing and this unit is ideally suited to manage this type of environment. Only one output auto switches. NOTE - In either mode output 1 can be down-scaled to accommodate a room where one display is 1080P and another is 4K. 4K Up/Down Scaling : This technology is managed on output two. This will allow you to downscale 4K sources to1080p. This completely eliminates the problem that all other matrices have that forces them to "dumb down" the entire system even if there is only one old 1080P display. Extreme EDID Management : With 29 on board EDID's, including HDR EDID's, not getting a picture is simply a thing of the past. You can manage the input side of the switch by selecting a preloaded EDID. We also have the ability to INSTANTLY read an EDID from any connected display and apply it to the desired input, all with the push of a button. Goodbye EDID problems. 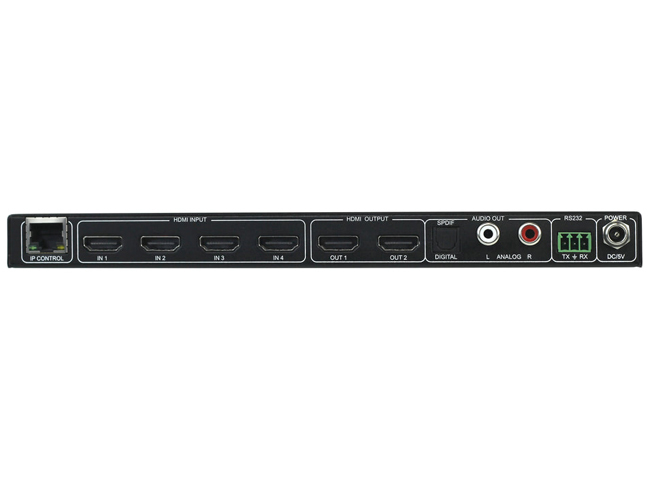 It features a digital optical toslink output for support for 7CH LPCM, Dolby Digital, Dolby Digital +, DTS, DTS Master Audio. 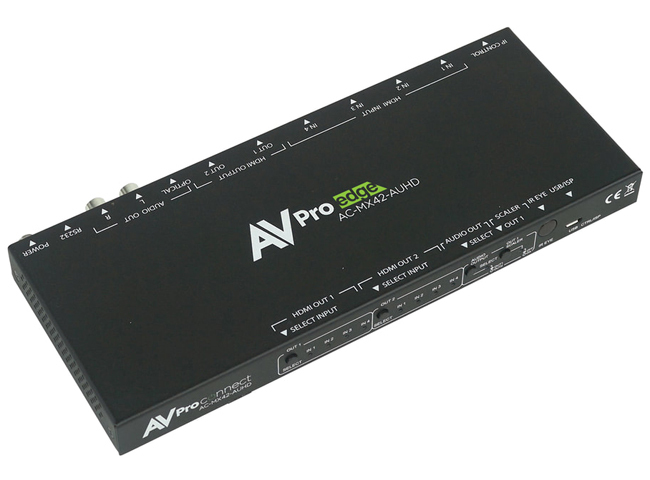 Why not buy this AVPro Edge AC-MX42-AUHD 4x2 HDMI 18 GBPS Matrix Switch with Scaler today?